Prime your locks for the hair smoothening goodness of the Ice Hair Conditioner Tool. The ice mist™ spray is pH-balanced to help hair cuticles gently close and seal in shine-boosting moisture. 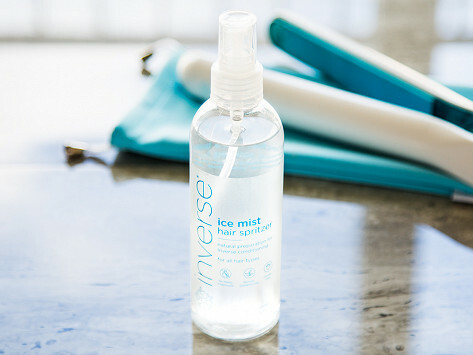 Dimensions: 7.5" x 2" x 2"
David Roe is the hair stylist and Maker behind the Inverse hair smoothening tool that uses ice—yes, ice—to make locks look and feel healthier. When his wife got great results rinsing her curly hair in freezing cold water, he learned that cold can help seal hair cuticles to better lock moisture in. So David began experimenting with ice to boost shine and leave hair smooth. Patented ice cores go from the freezer straight into the styling tool where they’re held in place by magnets. The cores are filled with a unique gel that maintains the perfect chilly temperature while you’re using it. Smooth the Inverse ice conditioner tool over damp hair to help seal moisture in—the opposite effect of hot tools, which can strip moisture out and lead to frizz. David also created an ice mist spray to use before you get started. It's pH-balanced to prime the cuticle to close and better prep for a session of icy cold conditioning.